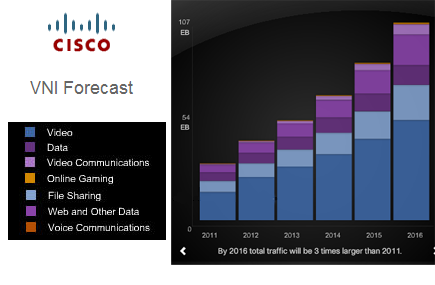 Total global IP traffic will grow three-fold between 2012 and 2017, according to Cisco's newly released Visual Networking Index Forecast. Cisco is projecting that PC-originated traffic will grow at a 14% CAGR, while other devices/connections will have higher traffic growth rates over the forecast period ― TVs (24%), tablets (104%), smartphones (79%), and machine-to-machine (M2M) modules (82%). By 2017, annual global IP traffic will reach 1.4 zettabytes (23% CAGR from 2012 to 2017). – A zettabyte is equal to a sextillion bytes. "Busy hour" Internet traffic, (hours of the day during which traffic is highest), is increasing faster than average Internet traffic. Busy hour Internet traffic increased 41% in 2012, compared to 34% growth in average traffic. Metro traffic will surpass long-haul traffic in 2014, and will account for 58% of total IP traffic by 2017. Metro traffic will grow nearly twice as fast as long-haul traffic from 2012 to 2017. Content delivery networks (CDNs) will carry over half of total Internet traffic by 2017. Wi-Fi and mobile-connected devices will generate 68% of Internet traffic by 2017. Nearly half of total IP traffic will originate with non-PC devices (including tablets, smartphones, and televisions) by 2017. Fixed/Wi-Fi traffic will grow at a CAGR of 26% between 2012 and 2017, compared to a 16% CAGR for fixed/wired traffic. Globally, the average household had 4.7 devices / connections (including M2M) in 2012; the average household will have 7.1 devices / connections (including M2M) by 2017 (an 8.8% CAGR). Globally, there will be 8 billion IPv6-capable fixed & mobile devices/connections in 2017, up from 1.6 billion in 2012 (38% CAGR). Globally, 42% of all fixed & mobile networked devices/connections will be IPv6-capable in 2017, up from 14% in 2012. Asia-Pacific (APAC) will generate the most IP traffic by 2017 (43.4 exabytes/month), maintaining its leadership from last year. The Middle East and Africa will continue to be the fastest growing IP traffic region from 2012 – 2017 (5-fold growth, 38% CAGR over the forecast period); MEA was the fastest growing region last year as well (10-fold growth, 57% CAGR for the 2011 – 2016 forecast period) in this category. By 2017, the highest traffic-generating countries will be the United States (37 exabytes per month) and China (18 exabytes per month). For fastest growing IP traffic at the country-level, India will have the highest IP traffic growth rate with a 44% CAGR from 2012 – 2017. Second is Indonesia (42% CAGR) and third is South Africa (31% CAGR) over the forecast period. Globally, there will be nearly 2 billion Internet video users (excluding mobile-only) by 2017, up from 1 billion Internet video users in 2012. Internet video-to-TV traffic will increase nearly 5-fold between 2012 (1.3 exabytes per month) and 2017 (6.5 exabytes per month). By 2017, 3D and HD Internet video will comprise 63% of consumer Internet video traffic. Advanced consumer Internet video (3D and HD) will increase 4-fold between 2012 and 2017. VoD traffic will increase 3-fold between 2012 and 2017. Peer-to-peer (P2P) traffic will decline at a CAGR of -9%, while web-based and other file sharing traffic will grow at CAGR of 17% from 2012 – 2017. By 2017, global P2P traffic will be 65% of global consumer Internet file sharing traffic, down from 85% in 2012. Overall business IP traffic, which includes Internet, backup, VoIP, etc., will nearly triple between 2012 and 2017. In 2012, business IP traffic represented 20% of monthly total global IP traffic (consumer IP traffic represented 80% of monthly total global IP traffic). By 2017, business IP traffic will represent 18% of monthly total global IP traffic (consumer IP traffic will represent 82% of monthly total global IP traffic). Business Internet video traffic will from 5.3-fold from 2012 to 2017.
Business Internet video traffic grew 52% in 2012. Video will account for 58% of all business Internet traffic in 2017, up from 31% in 2012. By 2016, annual global IP traffic is forecast to be 1.3 zettabytes – (a zettabyte is equal to a sextillion bytes, or a trillion gigabytes), according to the newly issued Cisco Visual Networking Index (VNI) Forecast (2011-2016). For comparison, the total global IP traffic generated in 2011 was 369 exabytes. The additional traffic added in 2015-2016 alone is expected to be 330 exabytes, or an addition over that 12 month period nearly equal to the entire IP traffic volume last year. More devices: Cisco predicts that by 2016 there will be nearly 18.9 billion network connections ―- almost 2.5 connections for each person on earth -- for tablets, mobile phones, and other smart devices as well as machine-to-machine (M2M) devices. Cisco estimates there were 10.3 billion connections in 2011. Faster broadband speeds: The average fixed broadband speed is expected to increase nearly fourfold, from 9 Mbps in 2011 to 34 Mbps in 2016. Mary Meeker, a partner at the venture investment firm of the Kleiner Perkins Caufield & Byers, presented her annula Internet Trends report at the D11 conference organized by The Wall Street Journal. Her series of 117 slides covers a wide range of key trends in mobile networking, smartphone adoption, advertising and social issues. 2.4 billion Internet users is 2012, up 8% Y/Y. 80% of Top Ten Global Internet sites are "Made in USA" while 81% of users are outside USA. 500 million photos are now uploaded and shared every day on Flickr, Snapchat, Instagram and Facebook. 100 hours of video are uploaded per minute to YouTube as of May 2013. Global mobile traffic is about 15% of total Internet traffic. Rising rapidly. In Korea, mobile search queries surpassed PC search queries in Q4 2012. There are currently about 1.5 billion smartphone users, representing about 21% penetration. The growth rate is 31% Y/Y. 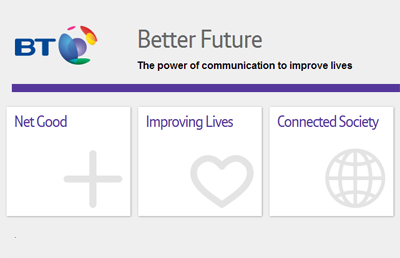 BT published its annual Better Future sustainability report, promising to use the power of communication to improve lives, ways of doing business and to make its overall impact on society a positive one. BT invested £27 million in 2012/13 to support its commitment to being a responsible and sustainable business. There are three focus areas - Connected Society, Net Good and Improving Lives – each with its own vision and an ambitious goal to achieve by the end of 2020. BT's 2020 goal is that more than nine out of ten people in the UK will have access to fibre-based products and services. BT's investment alongside 19 partnership investment projects has accelerated UK fibre broadband rollout to around 15 million premises already. BT's Connecting Africa initiative is providing internet services via satellite to 20 locations, creating access to information and critical services for up to 700,000 people. BT's 2020 goal is to help customers reduce carbon emissions by at least three times the end to end carbon impact of its business. BT has achieved its target of hitting an 80% reduction in UK carbon emissions three years ahead of deadline despite increased volume. BT reduced its energy consumption in 2012/13 by 3.3%, saving the business £33m annually. BT's 2020 goal is to use BT's skills and technology to help generate more than £1bn for good causes. "Our Better Future programme signals BT's evolution to a new model in which every part of the business and every employee has a role to play in realising our visions and achieving our goals to create a better business with a better future. It's a long-term commitment, focusing on what we do best – bring together our networks and our technology with the expertise of our people to make a better world. Using the power of communications, we can benefit our customers, our bottom-line and the communities we operate in," Niall Dunne, stated Chief Sustainability Officer. The Committee on Foreign Investment in the United States (CFIUS) completed its investigation of the proposed transaction between Sprint and SoftBank and determined that there are no unresolved national security issues relating to the transaction. As part of this aspect of the transaction’s clearance, Sprint and SoftBank have entered into a National Security Agreement with the U.S. government. Details of the agreement were not made public but it is expected to cover the exclusion of telecom infrastructure from Huawei and ZTE in the merged company's U.S. network, including Clearwire. 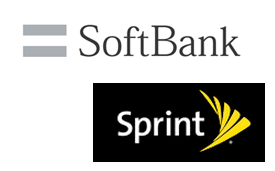 The National Security Agreement will terminate in the event that the merger between Sprint and SoftBank is not completed. The FCC is still conducting its public interest review of the proposed merger. Sprint shareholders must also vote on the deal. The companies believe the deal is on track for consummation in July 2013. 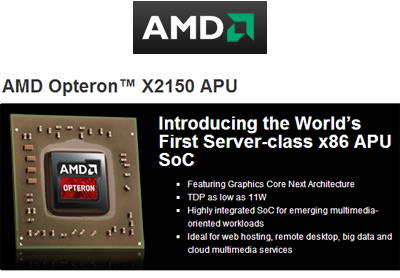 AMD introduced its Opteron X-Series x86 processors for scale-out server architectures. The AMD Opteron X2150, which consumes as little as 11 watts, is the first server APU system-on-a-chip integrating CPU and GPU engines with a high-speed bus on a single die. It incorporates AMD Radeon HD 8000 graphics technology for multimedia-oriented server workloads. The AMD Opteron X1150, which consumes as little as 9 watts, is a CPU-only version optimized for general scale-out workloads. “The data center is at an inflection point and requires a high number of cores in a dense form factor with integrated graphics, massive amounts of DRAM and unprecedented power efficiency to keep up with the pace of innovation of Internet services,” said Andrew Feldman, corporate vice president and general manager, Server Business Unit at AMD. “Fundamental changes in computing architectures are required to support space, power and cost demands organizations need to deliver compelling, new infrastructure economics,” said Paul Santeler, vice president and general manager, Hyperscale Server business segment, HP. “The new x86 AMD Opteron X-Series processors integrated into future HP Moonshot servers will continue to push the boundaries of power efficiency for social, mobile, cloud and big data workloads." AT&T launched a cloud-based service designed to simplify how businesses access and share content with coworkers and teams across multiple mobile devices. "The use of mobile devices continues to be a key tool for SMBs as they look to manage and expand their operations," said Lou Delery, AT&T Senior Vice President of Small Business Marketing. "Our new Mobile Workplace solution puts the work experience at the fingertips of employees regardless of where they are and allows small businesses to become more productive." 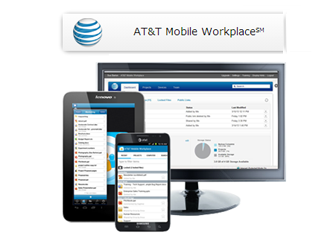 AT&T Mobile Workplace is available as a web-based solution supported by a desktop agent or mobile application that can be accessed and synched on web-connected devices. Business content can be viewed online or offline, enabling continued work even while in transit. The service can be self-installed and is backed by 24/7 U.S.-based remote, technical support from AT&T as needed. Pricing of AT&T Mobile Workplace starts at $6 per user per month for the Basic service package subscription. Each subscription includes cloud storage ranging from 25 GB to 100 GB. Cisco agreed to acquire JouleX, a start-up specializing in enterprise IT energy management for network-attached and data center assets, for approximately $107 million in cash and retention-based incentives. JouleX, which is based in Atlanta, Georgia, develops software that helps to reduce energy costs by monitoring, analyzing and managing energy usage of all network-connected devices and systems through a set of policies derived through analytics tailored for an enterprise’s needs. The company was founded in Munich and currently has research and development operations in Kassel, Germany. Cisco said JouleX complements its existing services portfolio by using the capabilities of the network to gain visibility into and control energy usage across global IT environments. 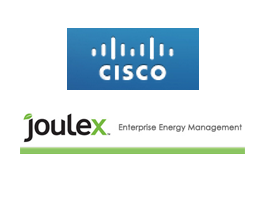 Specifically, JouleX’s energy management solution, together with Cisco EnergyWise™, will provide customers with a simple way to measure, monitor and manage energy usage for network and IT systems across the enterprise, without the use of device-side agents, hardware meters or network configurations. Zen Internet, a leading Internet Service Provider in the UK, has chosen the ADVA Optical Networking's FSP 150 to scale its Ethernet delivery platform and efficiently hand over services to service provider partners. The ADVA FSP 150 is a family of intelligent Ethernet access and aggregation devices designed to optimize site costs, increase service offerings and reduce operational expenditures. The platform monitors availability, latency, jitter and packet loss, all of which are critical for verifying SLA conformance and providing an advanced indication of performance degradation before a service outage occurs. Amazon Web Services has expanded its identity federation capabilities to support web identity federation. AWS said this enables developers to create cloud-backed mobile apps that use public identity providers such as Facebook, Google, or the newly launched Login with Amazon service for authentication. Apps can use Amazon.com, Facebook, or Google sign-in without having to write any server-side code and without distributing long-term AWS security credentials with the app. France Telecom-Orange will officially change its name to simply "Orange" on 01-July-2013. The name of the shares will be Orange under the ticker symbol' "ORA". Orange was adopted as the single brand for all of the company's mobile, Internet and digital services in 2006. The fixed line services adopted the Orange brand in 2012.